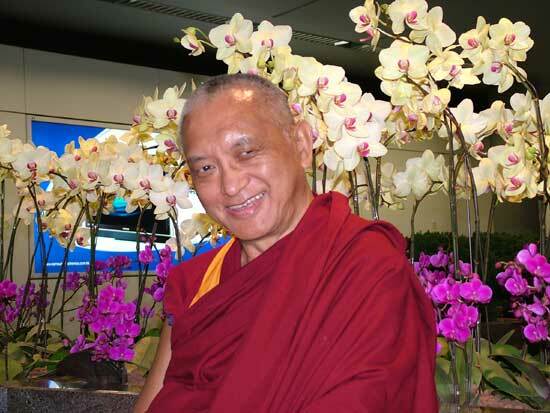 Rinpoche’s long Asian tour is ended, and the next teachings Rinpoche will give are on the 3 Principles of the Path and the Medicine Buddha jenang at Longku Zopa Gyu Center in Switzerland on August 14th and 15th. Rinpoche then travels to Spain, August 20 – 22 at Nagarjuna Madrid for teachings and the Chenrezig jenang, next to then August 26-28 at Osel Ling where Rinpoche will give the Milarepa initiation and the oral transmission and teachings on the Vajra Cutter Sutra. 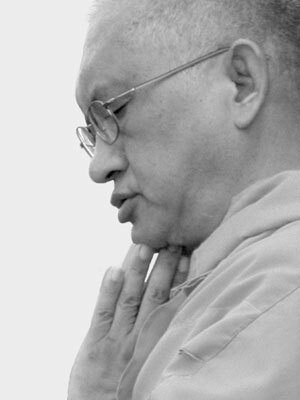 Rinpoche then gives teachings on the Three Principles of the Path and the lung of the Golden Light Sutra in Nagarjuna Barcelona, Sept 2 – 4. Then we move to the USA where on Sept 10th-11th Rinpoche will give teachings and Amitabha long life initiation organized by Guhyasamaja Center. 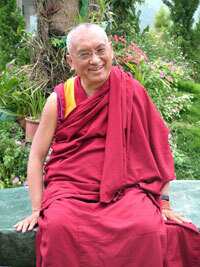 Rinpoche will teach part of the Kopan November course. The most important thing that determines how quickly you reach enlightenment is how strongly you need, rely upon and devote yourself to your guru—the stronger, the quicker. It is your guru’s kindness that prevents you from falling into the lower realms, where you will suffer for an inconceivable amount of time, and allows you to gain a higher rebirth. The better you understand suffering, the more you need to rely upon your guru; the better you understand how all of samsara—including the deva realm—is suffering in nature, the more you need, rely upon and devote yourself to your guru. The more you suffer the more you need to rely upon and devote yourself to your guru. The more you learn the more you respectfully need your guru’s help and rely upon and devote yourself to your guru. The greater you feel the need to attain enlightenment the more you see the need to rely upon and devote yourself completely to your guru. The further you progress along the path the more you need to rely upon and devote yourself completely to your guru. The greater you feel the extremely unbelievable suffering of sentient beings the more you feel how urgent it is to rely upon and devote yourself completely to your guru. The more you practice tantra the more you need to rely upon and devote yourself completely to your guru. The essence of your life is practicing pure guru devotion, realizing the incomparable kindness of your guru, who is kinder than anybody else. Taken from a very small stack of blue Post-it notes with extremely illegible hand writing, some words only having one letter in them, handed by Lama Zopa Rinpoche to Ven. Holly Ansett with the comment that maybe they can be useful somewhere. Transcribed by Ven. Holly at Kachoe Dechen Ling, Aptos, CA, April 2005, and edited by Nick Ribush. 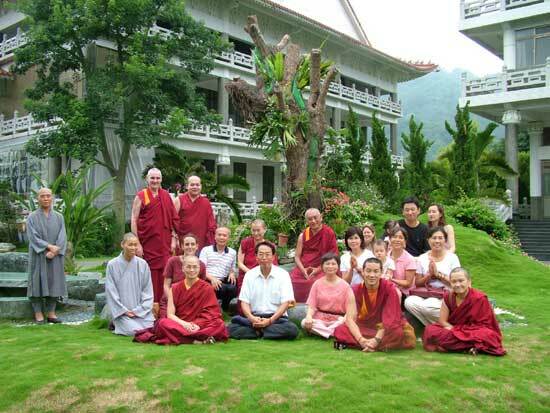 Rinpoche recently spent just over three weeks visiting and teaching at His centers in Taiwan, and I was very lucky to be able to be part of the trip, meeting those who serve the centers and of course observing Rinpoche in action! it might be doing pujas with the resident geshes and lama gyupas all morning straight after an all-night initiation, it might be choosing some earrings for a gift, accepting or declining or thinking about an invitation, it might be asking questions of a man who can talk with Chenresig, it might mean giving a profound yet concise teaching and then meeting with someone who would like to help a center or project for a few hours late into night, and then dictating some answers to letters….and more! A visit to a beautiful nunnery is a pilgrimage, an opportunity to create merit and purify, not just sightseeing. Being around Rinpoche one gets a taste of the unbelievably broad range of Rinpoche’s world of benefit, which as we know is so vast, and includes Rinpoche’s FPMT centers and study groups, projects which will help fulfill His Holiness’ wishes, projects to help Tibetans in Tibet, guiding students in every area of their life, helping Sangha communities, etc. etc. – and always being present for and treating others with such exquisite care, courtesy and humour – and no false sentiment. And of course amazingly Ven Roger is always there to pick up on work and jobs which Rinpoche indicates are important, working to fulfill Rinpoche’s wishes. And one sees more clearly how each of us in the different parts of Rinpoche’s mandala have also taken up some responsibility, some necessary task to help to fulfill Rinpoche’s wishes. And as the visit nears its end, you see how the pressure of people wanting the benefit of Rinpoche’s advice gets more and more intense – and realize why Rinpoche needs an International Office to help support all these people and activities around the world. While in Taiwan, Rinpoche gave me some extremely helpful advice for working in International Office, in an FPMT center, at home or at work – anywhere, anytime…..
You need to guard your attitude all the time, 24 hours a day. Doing just what your mind says is very dangerous – even small problems can lead to suicide when emotions get involved. Thinking that this is what I feel, so I can do anything – it’s usually what the delusions want, not what the bodhisattva wants. This leads to long-term harm. What Rinpoche mentioned for Universal Education is exactly what’s needed in an office. What Rinpoche wanted to add is humility. Though humility actually comes naturally if you are kind, and forgive others. Then also rejoicing when good things come to others. These are practical good qualities for anyone in the world if you want a happy life. The point is to be humble, but when there’s a need to clarify, to say something, to be able to say it. A center or an office is a place for Dharma practice. When one goes to the office, dealing with people, one has to recognise it’s a place to practice lam-rim, the Three Principles of the Path, tantra, and the 6 paramitas. The 6 paramitas fit very well for daily life – they offer protection for you. Everything is there. If one doesn’t put effort into this, then problems arise. Without this, things won’t succeed, won’t be smooth, people won’t support you. If people are happy, they will support you. 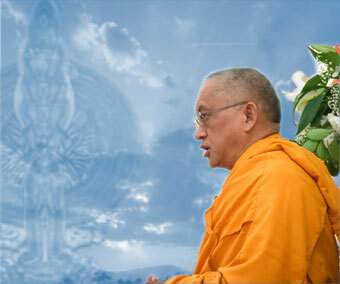 We have meetings in FPMT, but that isn’t enough. We have to really put it into practice in work, when we go back. 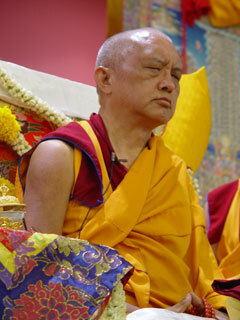 At FPMT meetings all the nice advice is there, but when you go back, if you don’t practice, all the problems come. Think of home and office as practice. It’s a wonderful practice, a great challenge. Before you go to the office think ‘I’m going to practice Dharma: 3 Principles of the Path, 6 paramitas’. The office is a place for tantric practice – see everyone as the deity. Everything is in the nature of blissing out! Nothing is boring or upsetting. Don’t get disturbed if you hear problems – our ears are made to hear problems! Hearing problems are like earrings, they are both different decorations for the ear! Question about the confusion that arises between trying to see and accept everything in Dharmic terms and yet wanting to change negative things. You have to clarify this. If you don’t, then the center/office can’t develop. Be humble, don’t be dumb! Otherwise can’t make the work better. Try to explain within your practice, lam-rim, then the mind doesn’t go negative, and things go better, smoother. Think how all sentient beings are so kind, all have been our mothers, shown such great kindness, then respect comes. Think that Buddha, Dharma, Sangha come from this person, all happiness in life comes from this person, they are so precious. Then respect comes. 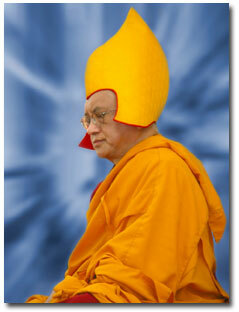 Think that this person is cherished the most by numberless buddhas and bodhisattvas, like a beloved child. This person is like their heart. Then you dare not say any bad words, you offer service, you offer comfort as much as possible, never dare to harm or hurt. We need wisdom to discriminate what needs to be said and not to be said. What’s the right time. Depends on analysis. It’s not easy because we don’t have clairvoyance. Bodhisattvas say we need clairvoyance in order to benefit sentient beings. Even without omniscient mind, clairvoyance, it is our responsibility to use our intelligence to do as best as we can. Try one’s best. Might not be perfect. Can’t succeed every time, but sometimes can. There is nothing more than actualizing the lam-rim. This is the best life, most meaningful life in the world, including tantra, which actually looks yummier. But lam-rim is like yummy cream on cake, actually lam-rim is the cream. By having recited this mantra, if you make one stupa or tsa-tsa, you receive the merit of having made ten million stupas or tsa-tsas. 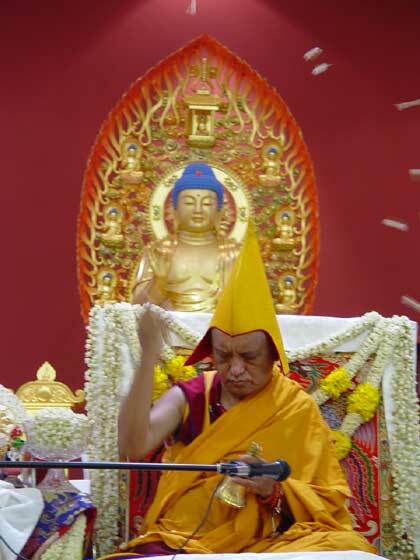 By having recited this mantra, if you touch any of the four elements [earth, fire, water, air] those elements are blessed two times the power of a stupa, and anyone who sees you or touches you is purified of the five uninterrupted negative karmas, 1 and they will be born in a higher caste. By having recited this mantra you will have long life, be purified of the five uninterrupted negative karmas, have wealth, and will remember past lives. You will be protected from all harm and become enlightened. If you recite this mantra and make a billion story stupa or stupa the size of a fingertip, you collect the same amount of merit as having made ten million. After you recite this mantra, if you make one, you receive the same benefit of having made ten million stupas. That means however much merit you receive from making one stupa—which is inconceivable merit—is multiplied by ten million. For example, if you are building a five-story stupa, you receive the benefit of having built ten million five-story stupas. It is important to recite this mantra before you begin the work on building the stupa, but also you can recite the mantra every day during the construction of a stupa. It is the same for statues and tsa-tsas. By reciting this mantra, if you touch any element (fire, water, air, earth), the elements are blessed. Then when those elements touch any being, that sentient being is liberated double the power of a stupa and purified of their five uninterrupted negative karmas. This means if you recite this mantra and then swim in the water, the water is blessed and becomes so powerful. When the water touches any sentient being, including those living in the water—numberless insects and creatures from the largest whale to the tiniest insect that can be seen through a microscope, and even the human beings who are diving and playing in the water, they all are liberated from negative karma by the water touching their bodies. It’s the same for the rest of the elements. They have so much power to purify other sentient beings. By reciting this mantra, you become meaningful to behold—even more powerful than a stupa. You become more powerful to liberate others and anybody who sees you or touches you, their negative karma is purified, twice as powerfully as a stupa. By reciting this mantra, if you do massage, it becomes so beneficial because when you touch other people’s bodies, your touch purifies them. By reciting this mantra, anybody who sees you is liberated from the lower realms and their five uninterrupted negative karmas are purified; no question about the ten non-virtuous actions. This means even if you are walking on the street, or in a department store, at the train station, anywhere where there are a lot of people, even if you have no other purpose, just walking around purifies sentient beings’ minds, because you have recited this mantra. You could do some strange thing, like make a strange noise, so that everybody looks at you. Just by that they are purified. This mantra can be recited a few times at the beginning of each day along with the other morning prayers and mantras, as well as before making statues, stupas or tsa-tsas. People who could use this mantra to benefit others: anyone who is seen by people or who touches people or animals, such as performers, models, public speakers, teachers, nurses, doctors, or veterinarians, etc. Anyone who touches objects or elements that other sentient beings will see or touch, such as cooks, bakers, potters, artists, painters, factory workers, dry cleaners, swimmers, etc. In this way, it is the same as the Zung of the Completely Pure Stainless Light. 1. The five uninterrupted negative karmas are killing one’s father, killing one’s mother, drawing blood from a Buddha, killing an Arhat, and causing disunity among the Sangha. If even these extremely heavy negative karmas are purified, then there is no question that the ten non-virtues are purified. 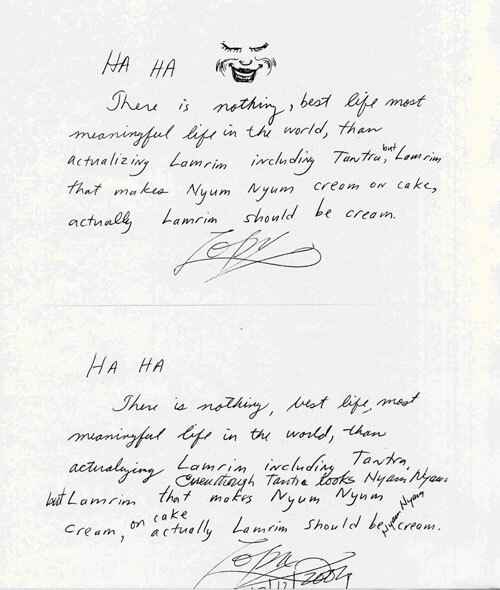 Colophon: Scribed by Ven.Matthew Frum, Kachoe Dechen Ling, February 2005. Lightly edited by Ven. Holly Ansett and Thubten Mindrol, FPMT Education Services, June 2005. 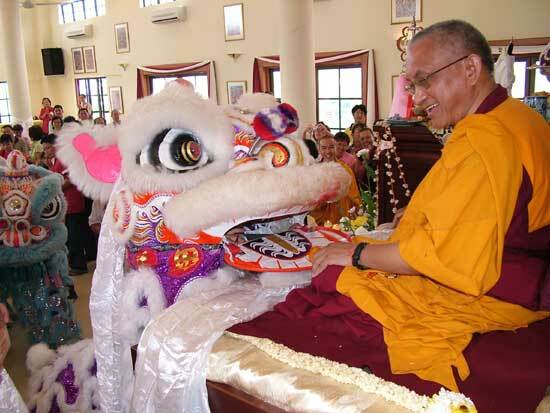 Rinpoche during the long life puja offered by Amitabha Buddhist Center, Singapore, May 2005.